This analysis resulted from a 2014 request from a journalist who provided the coordinates of the ballistic missile base and the mountain site. The person requested that they remain anonymous. The purpose of the hardened underground complex is not yet available publicly, but it could serve as a hardened underground storage site for strategic reserves and hence a means of protecting a counterforce nuclear strike capability. Given that Pakistan’s preferred delivery vehicle for nuclear weapons is missiles with warheads and given the physical characteristics of the site, this site is an ideal, probable storage site for parts of Pakistan’s nuclear arsenal. Although the site is located in the province of Baluchistan, which has endured many local insurgencies, Pakistan is likely more focused on having a secure area in a remote mountainous area in the middle of the country, as far as possible from its international borders, including India. Figure 1. A 2014 DigitalGlobe image showing the layout of the underground site and new security measures that create a secure complex. Figure 2. A 2012 Google Earth image shows the excavated spoil piles at the three tunnel entrances. The area has limited archived Google Earth coverage, with the more recent image of the underground site from December 2014 having been purchased separately from the DigitalGlobe archives. This site, first identified in the United States by FAS,2 is a possible site for the storage of nuclear-capable ballistic missiles and their transporter erector launchers (TELS), and was built between 2004 and 2010 (see figure 3). Most likely, it is an operational storage site for missiles and their TELs (and likely also nuclear warheads) consistent with Kristensen’s determination. However, the site is relatively soft, and hence potentially susceptible to an enemy first strike. North of the possible ballistic missile site are several military related facilities. An overhead image (see figures 4-11) shows the possible missile base, the military training facility, the garrison (called a cantonment in this image), and a sensitive operations facility having substantial physical security. Figure 4. 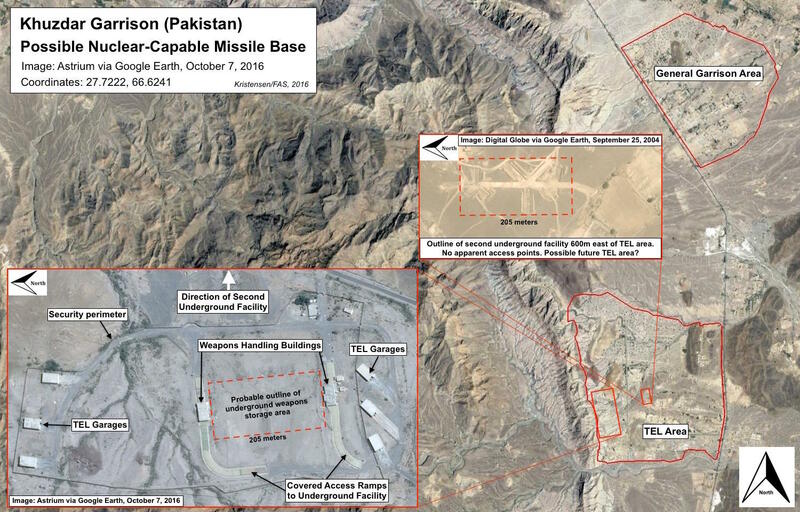 Satellite image overview of the immediate surroundings of the FAS identified missile base, which includes a military training facility, the Khuzdar cantonment, and a possible sensitive operations facility. Figure 5. Potential Sensitive Operations Facility. Clockwise from top left image: A: September 2004, high security compound with buildings visible; B: August 2009, buildings demolished; C: December 2013, security wall being constructed and modifications to the main building; D: October 2016, security wall and modifications complete. Figure 6. Military Training Facility. According to Schreiber Translations, Inc, the inscription reads “Submission in good faith to the agitation based on religious tenets is a path that leads to GOD.” This is the Pakistani Army Motto. An August 10, 2009 image (figure 7) shows the text more clearly. Figure 8. Military Garrison or “Cantonment”. Suspected officer’s compound in the north of the military base. Figure 9. New insignia visible in recent images demonstrate continued usage and activity at the site. Figure 10. Possible Missile Base. An October 2016 image of possible ballistic missile TEL garages and underground entrances. For annotation and relative location within the base, see figure 3. Figure 11. An October 2016 overhead of the possible missile base. For more details and annotation, see figure 3, for relative location within the complex see figure 4. There is a high voltage power line that begins near the general garrison area identified above and goes near the underground mountain site. Based on a review of historical Google Earth imagery, the construction of the power lines proceeded from west to east, starting at an electrical substation by the garrison area and moving toward the mountain facility. Although the power lines go past the mountain facility, they do not go into the mountain facility itself, or at least we cannot find an electrical substation nearby. The power lines continue into a very remote area. It could not be established, but it is reasonable to speculate, that the power lines provide electricity to the mountain facility. The power lines follow roughly, but not consistently a major highway, the Ratodero-Gwadar Motorway (Highway M-8). This paved, well maintained highway also links the mountain site to the Khuzdar Garrison. The ground distance between the two sites is approximately 42 kilometers. See figures 12, 13 and 14. Figure 12. Powerline from the military base to the Support facility or area at the underground complex and continuing onward into the desert. It passes closely by the Support area, where in a 2014 image new construction can be seen. Figure 13. High power transmission line towers are visible near the road entrance to the Support area and underground complex. Figure 14. The access road to the Support area and the underground complex from the main highway is being covered while an alternate road is built next to the original one. This construction appears to be designed in response to the potential intermittent flooding that can be expected in this river bed. A new possible security trench can also be seen in the lower, center part of the figure. Construction at this site began between 2009 and 2010 and continued over the next couple of years. Google Earth coverage is available up to 2012. A December 2014 image was acquired from the DigitalGlobe archives. The support area is directly connected to several tunnel entrances by a single unpaved access road (see figures 15 and 16). The nearest entrance to the Support area is the North portal. The three identified portal entrances are large. They can accommodate the largest possible vehicles. The 2014 DigitalGlobe images show considerably more security than is visible in a 2011 image. Visible is security perimeter fencing and entrance road chicanes to slow approaching vehicles (see figures 16, 18 and 20). In contrast, in 2011, the security was relatively modest, with some deliberate signature suppression (e.g. no obvious perimeter security). Nonetheless, a 2011 image shows chicanes (figure 17) and does include at least one possible anti-aircraft position and guard post (figure 19). The purpose of the hardened underground site is not available publicly. The configuration of the site would discount it being an underground nuclear test site or other research and development site. It also does not appear to be a clandestine production facility, such as gas centrifuge or other sensitive fuel cycle facility, given the lack of the necessary operational support infrastructure. It appears to have been constructed as a hardened storage site for strategic reserves and hence a means of protecting a counterforce nuclear strike capability. Given Pakistan’s preferred delivery vehicle for nuclear weapons is missiles with warheads, and given the observable characteristics of the site, this site is an ideal storage site for part of Pakistan’s nuclear arsenal. Although the site is in the province of Baluchistan, which has endured many local insurgencies, Pakistan is likely more focused on having a secure area in a remote mountainous area as far as possible from its international borders, including India. Figure 15. Underground complex in perspective view showing the Support area and underground tunnel entrances. Figure 16. Overview of area showing the Support area. Visible is increased security including guard posts near the entrance to the Support area and along the road to the underground facility. Figure 17. Bird's-eye view of the Support area. Figure 18. Visible along the road leading from Support area to the portals is increased physical security and fencing, December 2014. See also figure 20. Figure 19. Possible Anti-Aircraft Artillery (AAA) and guard position in 2011. Its relative location can be seen in the image below, figure 20. Figure 20. Notable improvements to physical security of the underground complex visible in the 2014 image. There is new security fencing and several new guard posts. Figure 21. A close-up of the West portal in 2012, showing the significant size of the tunnel entrance. Figure 22. The East portal in 2014. Figure 23. Approach to East portal in close-up. Figure 24. A North portal area close-up shows new excavation.